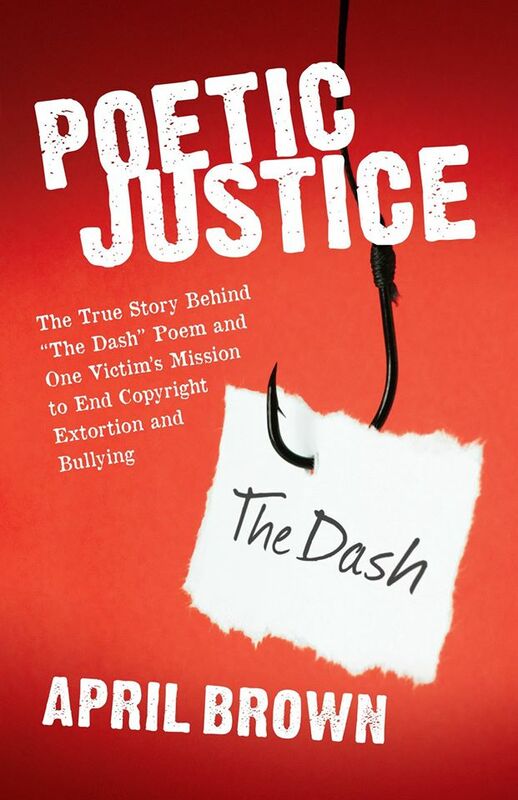 In my continuing series of editorials in defense of April Brown, author of the upcoming book “Poetic Justice: The True Story of The Dash and One Woman’s Quest to End Copyright Extortion and Bullying”, it appears that Dash Poet, Linda Ellis, isn’t afraid of getting her hands dirty and attempt to play the “shame game” with April in an attempt to discourage April from releasing her book. Specifically, Ellis informed April about justfreespeech.com on January 7, 2015. For those of you who have not seen it, you should go visit and see for yourself. On October 7, 2014, oral argument for my appeal was presented at the Georgia Supreme Court. I had two legal powerhouses appear on my behalf in the form of New York Attorney Oscar Michelen, legal advisor to ExtortionLetterInfo.com (ELI) and Eugene Volokh, First Amendment Legal Scholar and law professor at the UCLA School of Law. 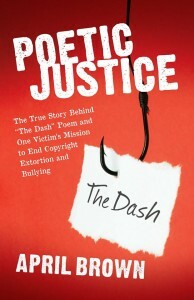 The Dash Poet had family lawyer Elizabeth W. McBride and girly Getty Images lawyer, Timothy B. McCormack. Without getting too far off-track, it appeared by my admittedly legally-untrained, non-lawyer eyes, her lawyers did not perform “optimally” on her behalf. You can watch the oral argument yourself and make your own determination. Interestingly, justfreespeech.com was registered just four days later on October 11, 2014! Perhaps it is only a coincidence but April had not launched any websites or social media accounts for her book until November 2014. Add to the fact that my lawyers and I made substantial arguments on behalf of Internet free speech in my appeal, it seems Ellis may have conceded that free speech might ultimately win the day in court and that she, in turn, was contemplating launching a “Matthew Chan shame-and-smear” website as her revenge upon me not knowing that April would announce her “Poetic Justice” book the month after oral argument concluded. For the few conspiracy theorists who might think that I masterminded the sequence of events, I had nothing to do with the timing of April’s book announcement. In fact, April surprised me when she informed our group that she wasn’t waiting until the New Year to announce. She said she was going to announce BEFORE the turn of the year and she followed through on her promise. In any case, in the here and now, justfreespeech.com is clearly all about “shaming and smearing” April. But let’s break this down, shall we? April has always been very outspoken in the three years I have known her. She speaks her mind and isn’t afraid to put herself out there. She frequently makes remarks of her own PERCEIVED shortcomings. She talks about the crap she has been through in life, sexism, and having to fight for business success, respect, and independence in her life. She talks about making dumb mistakes she has made along the way. On the flip side, April talks about how she values friendship, loyalty, free speech, camaraderie, empowerment, and righting wrongs in this world. Of course, anyone who knows April knows that she is also not afraid to engage in some shameless, self-promotion as needed. After all, what successful entrepreneur and business person doesn’t indulge in shameless, self-promotion from time to time, right? Big picture, April discusses BOTH her assets and liabilities, her strengths and weaknesses, her virtues and flaws, the good and the bad. In my eyes, that is called “being real and authentic” unlike the walking hypocrisy that lives within the Dash Poet. Perfection in a person is an absolute lie and myth. My stage name was Brenda Bullet. I loved this routine. My brother Mike served during the VietNam war and he helped me put together this uniform. I’m wearing his army jumpsuit, his hand tooled leather Harley motorcycle belt, his cotton army belt, army boots, and a squirt gun. The Tampon bandelero was my idea. Gotta love the big hair of the 80s. This job would have been a whole lot easier had I been funny. Obviously I wrote my own material. I thought I was hysterical. You can hear my girlfriend Kathy “Rio” Laird leading the laughter with her own loud laugh after every joke. If she hadn’t been in the room I am sure I would have died. This was one of the best times of my life. On this night I performed with Arnold Mukai (Milk commercials), Gary Larsen an Geoff somebody. Two weeks later I went to LA and worked at Mitzi Shore’s comedy club. I was scared to death and never did get any better than this. Still, I have some amazing memories. I met Robin Williams, Andrew Dice Clay, Howie Mandel, Richard Belzar, Wanda Sykes, Sandra Bernhart. Roseanne Barr just hit. I met my lifelong girlfriend Kat Simmons who is a successful comedian and animal rights activist. I hung in there for 3 years. I just did not have the talent. Still I will always treasure the memories. Watch the video that April herself posted online, read April’s description of the video. You may or may not like April’s comedy but I don’t see her comedy as being any more offensive than Kathy Griffin, Joan Rivers, Lisa Lampenelli, Chelsea Handler, Whoopi Goldberg, Sarah Silverman, Roseanne Barr, and scores of other successful comediennes. I think that is all that needs to be said whether April needs to be “ashamed” or “embarrassed” by her comedy video. Next up, April had a run-in with an “Appalachian-descendant” neighbor (*snark* for the humor-impaired) that made complaints to Animal Control about one of April’s cats allegedly an “escapee” from Whisker City. Let’s assume it was true that it was one of April’s cats and it got loose and caused some mischief. Let’s assume that the cat was unlicensed. Can anyone tell me of an animal shelter or humane society that uses volunteers who work for free or near-minimum wage that won’t occasionally make a mistake that results in an “escapee”? Regarding the licensing issue, I think it is safe to say that most municipalities use licensing as a way to generate easy revenues, not a safety issue. In my view, April manages and supports an animal shelter to care for unwanted cats and kittens (often a thankless job) but she also needs to pay a license for each animal on top of that for that “privilege”? April has told me that she often subsidizes Whisker City because she doesn’t spend enough time raising money for Whisker City. So, April periodically takes money from her profitable charity auction business to subsidize Whisker City? If that is the case, Whisker City is TRULY a non-profit. In fact, Whisker City is a MONEY-LOSER for April and yet she soldiers on with the animal shelter because of her love, commitment, and dedication to unwanted cats and kittens. What a terrible woman April is for having dealt with one complaint. I have never seen any photos or videos of Whisker City before but it appears that April has an online webcam she regularly uses to monitor her feline tenants. I was stunned by the video I have seen. April’s cats and kittens live a life of luxury! I have been to many animal shelters and few look as clean, spacious, and as luxurious as the one shown by April’s webcam. I am embarrassed to say that the room her cats and kitten live in are cleaner and more organized than my own room! Regarding the threat of “exposing” the finances of Whisker City, it appears to be a matter of public record. I am certainly not an expert on non-profit, charity finances but from what little I know, 98% of expenses spent on program services is actually quite phenomenal. I have been told that 90% is the benchmark for charities. It means that a good charity should direct MOST of its money to providing the services and benefits it advertises, not into management and administration. Without looking at the details of her accounting, only 2% of money spent is being used for management and administration of Whisker City. It is notable that Blue Sky Charities was established in 1995! It has been around for a solid 20 years. All in all, if the Dash Poet’s only “dirt” into April’s 20-year charity is last year’s complaint, I think she is doing great. No one operates any business or project of any consequence in the public eye for 20-years and not get a complaint by someone. Regarding the insinuations of April’s “illegal wiretapping” recording a law officer, it appears the Dash Poet once again needs some enlightenment. She has apparently not heard of the huge outrage over Ferguson’s Michael Brown or NYC’s Eric Garner killing incidents. She has missed the memo that it is entirely legal to video-record law enforcement officers doing their job as long as it doesn’t endanger the officers or prevent them from doing their jobs. There is an abundance of “unauthorized” and “secret” recordings of police officers on YouTube and they are entirely legal. There are both interior and exterior videos, first-person and third-person videos, videos where officers “know” they are being recorded, and other videos where officers are under “secret” surveillance. They are all legal. It is actually good advice to record any interactions and confrontations you have with law enforcement officers to prevent any mischaracterizations or erroneous testimony. That is why police departments all over the U.S. are being encouraged to use body-cams partially as a result of the outrage of Ferguson’s Michael Brown and NYC’s Eric Garner police killings. Video recording any potential conflicts with law enforcement is a smart thing to do and highly recommended, not a “bad” thing to be “ashamed”. In conclusion, anyone with any intelligence looking at the bigger picture can see the “smearing and shaming” of April on justfreespeech.com is one HUGE FAIL and actually makes the Dash Poet look quite small and desperate. Fortunately for her, she has her Chinese Wall in place to shield her Dash readers from what is truly going on.